Chief: "Max, you realize you'll be facing every kind of danger imaginable." When Ian Flemming's Dr. No was released in 1962 it took the world by storm. British secret agent James Bond became such a mainstay in our pop culture that even over 40 years later we still flock to the theaters to see his adventures. Ever since Sean Connery graced the screen and ordered his shaken martini there have been many spy shows and movies that paid homage to Mr. Bond. In 1965 Get Smart was one of the first, and would you believe, one of the best. Created by Mel Brooks and Buck Henry Get Smart was well received among audiences and critics alike. Over the course of its five hilarious seasons and 138 episodes the show garnered many awards from such institutions as the Emmys and Golden Globes. 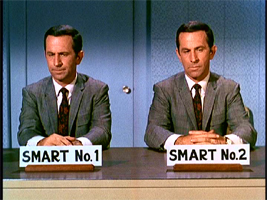 With seven wins all together and 14 other nominations it's hard to deny that Get Smart had a quality unlike any other. Many shows start out strong but this one in particular hit the ground running and knew what it was from the moment the pilot was created. It's this confidence that gave the show the tone that it needed to be a hit and in many ways helped the series become timeless. 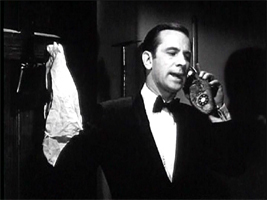 Starring Don Adams, Barbara Feldon, and Edward Platt, Get Smart was a comedic spoof on the spy genre done only in the way that Brooks and Henry could do. The show featured weekly attempts to take over the world by the secret evil organization known as KAOS. The only thing standing between us and being under their dominance was the presence of a group of American secret agents called CONTROL. Over the course of the series we got to see many CONTROL agents but each week the show focused almost entirely on Agent 86 Maxwell Smart (Adams). Through a wealth of skill and luck Smart has become one of CONTROL's top agents but even he couldn't do it alone all of the time. He's joined by Agent 99 (Feldon) in just about every episode and receives instructions and aid from the Chief (Platt). Each character was used brilliantly and their personalities and chemistry were endearing from the start. The same could be said for the stories which were so outlandish at times that they actually worked in a ridiculous sort of way. While James Bond villains used devious and often deadly methods to get their way, KAOS was frequently portrayed as a band of goofballs. Once in a while an agent in their ranks would rise above the insanity and present a real threat but more often than not their antics could be chalked up to childish pranks. Of course CONTROL was often the same way. Smart, for instance, was often paired up with a dog named Fang and met with agents hiding in mail boxes and lockers. This meant that Get Smart couldn't be taken seriously, though in all fairness it was never meant to be. Instead it gave the show a quirky charm that tiptoed the line between genius and idiocy. Adding to that charm was the wealth of gadgets that CONTROL created for Agent 86. Again, this feature was another spoof of the Bond franchise. 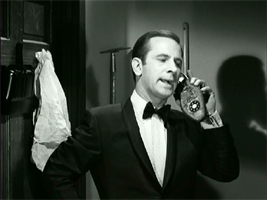 The first few episodes featured objects such as the shoe phone and the Cone of Silence which were used throughout the series. Smart also drove around in a 1965 Sunbeam Tiger roadster which was the show's answer to Bond's Aston Martin. Many items also came and went in the show such as the flavored suicide pills, inflatable jacket, and all sizes and shapes of guns. Like many shows from this era Get Smart evolved over the course of its run and built relationships around its main characters. Smart and Agent 99 had an oft teased love interest during the first few seasons and in the latter part of the show they got married. Beyond that change in character relationship Get Smart was a show that basically remained unaltered throughout all 138 episodes. Once the writers had a particular bible for the show in place they never really deviated from that. There were a few episodes here and there where the mold was broken but in the end it was all about 86 and 99 saving the world from KAOS. Now, history has taught us that marrying two main characters often means that you've run out of ideas and typically signals the death of a show. This was unfortunately the case for Get Smart but by the time the show ended it had simply run its course. Time Life's new DVD collection gives us a more cohesive look at the series than catching a few random reruns ever could. From the start to finish there are 25 discs worth of episodes and bonus features (4 discs with episodes and a fifth with bonus features for each season). Few TV series get the kind of treatment that this collection offers and because of that this set warrants a much closer look by fans and newcomers alike. The first season of Get Smart began September 18, 1965 and consisted of 30 episodes. As I already mentioned this was a series that hit the ground running and the first season is testament to that. Each character that is introduced, each plot that KAOS comes up with, and each joke is presented in such a manner that every episode is solid gold. In the 870 minutes of running time there really isn't a singly dud in the bunch. Few shows can claim to offer such quality in their first season. My favorite episode from the season was the two part story "Ship of Spies". This particular episode won an Emmy for best comedy writing. The plot revolved around the blueprints for a new super weapon and featured 86 and 99 taking a lovely little cruise on a boat where everyone is out to get them and the blueprints. Other great episodes from the first season included "Diplomat's Daughter" with the famous Craw, "Shipment to Beirut" where KAOS is turning informants into mannequins, "Kisses for KAOS" with exploding paint, and another favorite of mine "Too Many Chiefs" with 2 Chiefs running around in Max's apartment. Some of my favorite KAOS agents also turned up in this season. Take the Craw for instance. 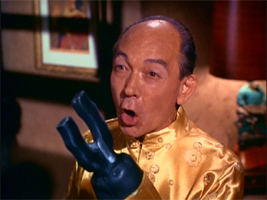 In the days before political correctness this Chinese villain spoke with a heavy dose of Engrish and was poked fun of by Smart because of it. Other notable characters that appear include Hymie the CONTROL Robot and the Hawaiian detective Harry Hoo. The first season was also filled with guest stars that many of you will recognize. Johnny Carson appeared in "Aboard the Orient Express", Leonard Nimoy showed up in "The Dead Spy Scrawls", and Ted Knight was included in "Stakeout on Blue Mist Mountain". With guest stars like these it's no wonder that Get Smart made a name for itself back in the 60's. 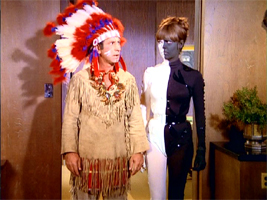 Superman fans will also appreciate that Richard Donner directed two episodes; "Washington 4, Indians 3" and "Our Man in Leotards". The second season of Get Smart continues the trend of quality television with another great batch of 30 episodes. If the first season could be considered great, the second would be phenomenal. My enjoyment of this season could be pinned down to a single factor; Siegfried. 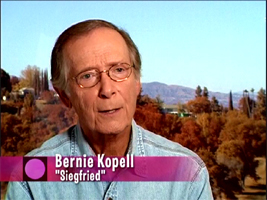 Siegfried (Bernie Kopell) was one of KAOS' top agents and probably the most recurring villains in the show. He says his decision to turn to evil could have come about when his mother wouldn't buy him a sled but whatever the reason he became a thorn in the side for CONTROL. In particular he became a nemesis of sorts for Agent 86 and appeared in several episodes throughout the series. Kopell's over the top performance of the character really made an impression with me and he made the most out of simplest lines ("Ve don't shush here!"). The character also became such a mainstay that he got his own sidekick. His first appearance was in one of my favorite episodes from the entire series; "A Spy for a Spy". Siegfried comes up with an ingenious plan to kidnap the Chief and use him as ransom to get his hands on the plans for the top secret X11. Smart answers back with another kidnapping of his own and soon KAOS and CONTROL members are swapped left and right. Eventually Smart and Siegfried are the only ones that haven't been kidnapped so they begin negotiations. When the dust settles and both sides come to an agreement Smart and company get the rotten end of the deal because KAOS has kidnapped their bus driver. Other brilliant episodes from this season include "How to Succeed in the Spy Business Without Really Trying" and "Rub-a-Dub-Dub...Three Spies in a Sub". Once again both of those feature Siegfried as the main threat but Ted Knight also turns up again for a role in "Pussycats Galore" which was another unique episode. This season was also the last time that the show would use Fang, the canine CONTROL agent. That was probably a good thing because to be honest there wasn't a lot that they could do with the character that they hadn't already done. The season finishes off strongly with a three part arc entitled "A Man Called Smart" that was originally supposed to be a Get Smart movie. Get Smart's quality continues long into its third season. The writers continued to come up with new stuff while infusing the familiar into each episode. Smart's witty dialogue and famous one-liners were constantly employed and KAOS' diabolical attempts at taking over the world continued. For the most part everything remained fresh right up until the last of the 26 episodes from the season. While the first two seasons were riddled with originality and new characters the third really just rode the wave created by what came before it. More one-off episodes were presented though there was a two part plot this time around that featured Don Rickles. "The Little Black Book" was a fun story that put KAOS' little black book in the hands of Sid (Rickles), who is one of Smart's army buddies. Instead of dialing up a hot date Sid gets a hold of KAOS, who sends two agents to retrieve the book. It was a real pleasure watching Adams and Rickles in action. Other big names that appear in this season include Buddy Hackett in "Maxwell Smart, Private Spy", Carol Burnett in "One of Our Olives is Missing", and Milton Berle in "Don't Look Back". The name dropping doesn't stop there though. Regis Philbin, Cesar Romero, Bob Hope, and Johnny Carson (again) all appear in episodes throughout this season. Even the creator, producer, and director of "I Love Lucy" (Jess Oppenheimer) directs the episode "One of Our Olives is Missing". That particular episode was another highlight from the third season mostly because Carol Burnett plays a role in it. Her character accidentally swallows an olive which is actually a disguised KAOS radio receiver. The evil organization sends Siegfried after the olive and it's up to Smart to protect the redhead. Burnett's character was one of the best additions to this season and in many ways she stole the show along with Adams. The fourth season is unfortunately where the quality of Get Smart started to slip a little. There were still plenty of great episodes this time around such as "The Not so Great Escape" with Siegfried and KAOS kidnapping CONTROL agents are transporting them to a prison camp, "The Impossible Mission" where we see 86 and 99 getting engaged, and "The Laser Blazer" with a guest appearance by Leonard Strong who played the Craw. Many guest stars were featured as well with Don Rickles making another appearance along with Tom Bosley and James Caan. My problem with this season was the way the writers developed the relationship between 86 and 99. Up to this point they had playful, often flirtatious banter that added a lot to each episode. It was obvious that the two cared for each other and that certainly helped add a certain spark to their screen time. For me, at least, it was the teasing that kept their relationship interesting. Once they get engaged and married some of the tone and material of the show changes. It also felt rather sudden and forced. Granted having the next step in the Agent's relationship allows for a different kind of content but many of the episodes that followed just didn't have the pop that the series did before. Take "Schwartz's Island" for example. This particular episode did in fact take place after the wedding but still has the charm of earlier episodes. It featured Smart and 99 whisking themselves away for a romantic honeymoon. Unfortunately Smart destroys their boat along the way and they get stranded on a deserted island; or so they think. Siegfried and his sidekick Shtarker live here as part of a KAOS outpost because this is in fact a manmade island that is also a giant magnet. Another fun part about this episode was that the island itself was a location for Gilligan's Island. Marriage was probably inevitable for the two characters but once the show went down that road there was no turning back. To me it almost felt as if something died; perhaps the inner child of the series if you will. Because marriage was involved the stakes were higher and in many ways the show became a little more adult. It still took risks and still made for a funny joke now and then but the tone had changed. This trend would continue into season five. And here we have the final season of Get Smart. The show had a great run up to this point but as I had pointed out the quality of the episodes had started to dwindle. The fifth season featured another 26 episodes and out of them I'd have to say that only three or four are what I'd call "great". "And Baby Makes Four" was probably the most prominent episode from this batch. If you can't tell by the title it featured Smart and 99 have twins. Thus the family became complete and thus another stereotypical transformation happened in the show. Granted this may have been something new back in the day but after 40 years we have seen so many characters going through the motions of married life that it is common to us. The twins add yet another new tool for the writers but it's not one that is exploited as well as earlier ones. Despite the overall lack of quality from this season there were still some more notable guest appearances. Martin Landau and Phyllis Diller appeared in "Pheasant under Glass", Vincent Price is KAOS's mad pharmacist in "Is This Trip Necessary", and Jonathan Harris found a spot in "How Green Was my Valet". Throughout the show it wasn't the guest appearances that made Get Smart as great as it was; they just added something special. This holds true even in the final moments of the series. I can say that despite the rough sailing this Get Smart does not go out with a whimper like you would think. It doesn't end with the bang that it started with either but the fact that it ended when it did was a good thing. It says something that a 40 year old show can still be just as entertaining today as it was when it originally aired. 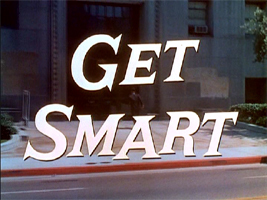 Get Smart was quality television for the bulk of its run and though the final season left a lot to be desired it's a series that sent you off with a positive impression. "Mr. Big", "Diplomat's Daughter", "School Days", "Our Man in Toyland", "Now You See Him, Now You Don't", "Washington 4, Indians 3", "KAOS in Control", "The Day Smart Turned Chicken"
"Satan Place", "Our Man in Leotards", Too Many Chiefs", "My Nephew the Spy", "Aboard the Orient Express", "Weekend Vampire", "Survival of the Fattest", "Double Agent"
"Kisses for KAOS", "The Dead Spy Scrawls", "Back to the Old Drawing Board", "All in the Mind", "Dear Diary", "Smart, the Assassin", "I'm Only Human"
"Stakeout on Blue Mist Mountain", "The Amazing Harry Hoo", "Hubert's Unfinished Symphony", "Ship of Spies, Parts I & II", "Shipment to Beirut", "The Last One in Is a Rotten Spy"
"Anatomy of a Lover", "Strike While the Agent Is Hot", "A Spy for a Spy", "The Only Way to Die", "Maxwell Smart, Alias Jimmy Ballantine", "Casablanca", "The Decoy", "Hoo Done It"
"Rub-a-Dub-Dub...Three Spies in a Sub", "The Greatest Spy on Earth", "Island of the Darned", "Bronzefinger", "Perils in a Pet Shop", "The Whole Tooth and... ", "Kiss of Death", "It Takes One to Know One"
"Someone Down Here Hates Me", "Cutback at CONTROL", "The Man From Yenta", "The Mummy", "The Girls From KAOS", "Smart Fit the Battle of Jericho", "Where-What-How-Who Am I?" "The Expendable Agent", "How to Succeed in the Spy Business Without Really Trying", "Appointment in Sahara", "Pussycats Galore", "A Man Called Smart, Parts I, II, and III"
"The Spy Who Met Himself", "Viva Smart", "Witness for the Persecution", "The Spirit Is Willing", "Maxwell Smart, Private Spy", "Supersonic Boom", "One of Our Olives Is Missing"
"When Good Fellows Get Together", "Dr. 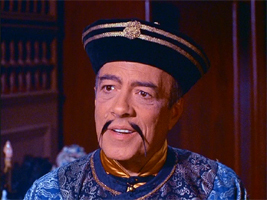 Yes", "That Old Gang of Mine", "The Mild Ones", "Classification: Dead", "The Mysterious Dr. T", "The King Lives?" "The Groovy Guru", "The Little Black Book Parts I & II", "Don't Look Back", "99 Loses CONTROL", "The Wax Max"
"Run, Robot, Run", "Operation Ridiculous", "Spy, Spy, Birdie", "The Hot Line", "Die, Spy", "The Reluctant Redhead"
"The Impossible Mission", "Snoopy Smart vs. the Red Baron", "Closely Watched Planes", "The Secret of Sam Vittorio", "Diamonds Are a Spy's Best Friend", "The Worst Best Man", "A Tale of Two Tails"
"The Return of the Ancient Mariner", "With Love and Twitches", "The Laser Blazer", "The Farkas Fracas", "Temporarily Out of CONTROL", "Schwartz's Island", "One Nation Invisible"
"Hurray for Hollywood", "The Day They Raided the Knights", "Tequila Mockingbird", "I Shot 86 Today", "Absorb the Greek", "To Sire, With Love, Part I"
"To Sire, With Love, Part II", "Shock It to Me", "Leadside", "Greer Window", "The Not-So-Great-Escape, Parts I & II"
"Pheasant Under Glass", "Ironhand", "Valerie of the Dolls", "Widow Often Annie", "The Treasure of C. Errol Madre", "Smart Fell on Alabama", "And Baby Makes Four, Part I"
"And Baby Makes Four, Part II", "Physician Impossible", "The Apes of Rath", "Age Before Duty", "Is This Trip Necessary", " Ice Station Siegfried", "Moonlighting Becomes You"
"House of Max, Parts I & II", "Rebecca of Funny-Folk Farm", "The Mess of Adrian Listenger", "Witness for the Execution", "How Green Was My Valet"
"And Only Two Ninety-Nine", "Smartacus", "What's It All About, Algie? ", "Hello Columbus, Goodbye America", "Do I hear a Vaults? 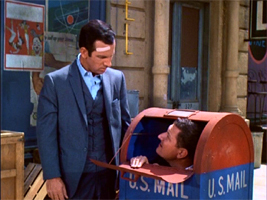 ", "I Am Curiously Yellow"
Time Life's Get Smart Collection comes with five seasons encased inside of a gray box. The packaging opens up to reveal the gate, door, and inevitable phone booth from the show's opening. It's a charming way for fans to crack into the DVDs for the first time but not entirely convenient on the shelf. Luckily the five seasons can be removed and look fine by themselves. Each season is color coded with geometric designs covering a clear slip case. Artwork is featured on the outside of each and includes characters such as 86, 99, Chief, Larabee, and Siegfried. A small booklet is included in each season as well with an episode list, insight from a crew member, and charming graphics. Each season houses five discs with the majority of supplemental material appearing on the fifth. Every episode (and most of the bonus features) also receives an introduction by Barbara Feldon and includes insight into some behind the scenes happenings and little known facts. Overall this packaging is really top notch in my opinion and helps cushion the $200 blow that you're wallet will feel from picking it up. With production dates that range from 1965 to 1970 the video quality for each season gradually gets better. I do have to say though that compared to what I have seen from taped reruns and even some of the stock footage supplied in the bonus material this DVD features a phenomenal cleanup job. The original black and white pilot episode for instance has noticeably had speckle and some grain removed. It's still present in most cases due to the quality of the print but it has been restored enough to be noteworthy. As I got further into the 138 episodes of Get Smart. each of them impressed me with top notch cleanliness for such an old show. There was some grain in each episode and, on more than one occasion, a bit of speckle was found but you can't scoff at the transfer. Preparing Get Smart for DVD was obviously a labor of love for the producers and I can honestly say that their work is appreciated. Get Smart features a Dolby Digital 2.0 Stereo audio presentation which was kind of surprising to me because I was expecting a mono track given the show's age. Once again the producers of this DVD did a fantastic job with restoring the show because the audio has been noticeably spruced up. Granted this is a stereo track so you can't expect much directionality or presence on the front stage but what's here is presented with decent quality. The sound has been cleaned up and features no distortion of any kind. Typically when I have watched other shows on DVD from the 60's there is a noticeable hiss in the background but I didn't encounter that here. Volume balance has been improved as well and I never once had to adjust my settings. If I have any complaint about this release's audio presentation it is that there are no subtitles; though that's just a minor gripe. 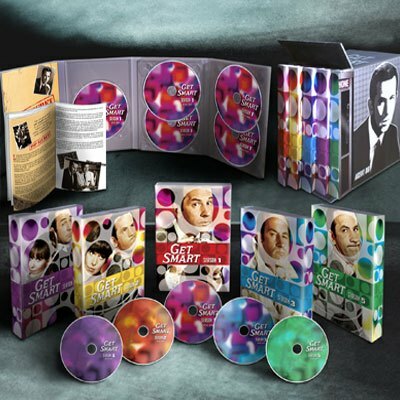 Get Smart the Complete Collection offers a whopping 9+ hours of diverse bonus material. The supplements available on this release make this the quintessential collection of Get Smart information. Few television shows bring this much to the table and it is another reason that it's near impossible to ignore the release. The bonus features in the first season begin on the very first disc. The episode "Mr. Big" features two distinctly different Audio Commentaries. Co-creators Mel Brooks and Buck Henry chime in for their own separate commentaries though I can't help thinking that a track featuring both would have been better. Both are interesting and informative though sometimes the direction of the discussion drops off while they are watching the episode. Both are still worth listening to so be prepared to watch "Mr. Big" at least three times before you're finished with it. The third disc includes yet another audio commentary. This one features Barbara Feldon and is for the episode "Kisses for KAOS". Unfortunately this track doesn't include as much information as the commentaries for "Mr. Big". Feldon does a great job giving an introduction to each episode in this collection but the track for this episode in particular feels kind of lacking. She just sits back and watches the episode, only chiming in during a few instances when something comes back to her. As I already mentioned the fifth disc is where the meat is. First up is a twenty two minute interview with Buck Henry that was recorded on 3/29/2006. The questions asked run the gamut from how the show was created to who was considered for the role of Maxwell Smart. The interview was pretty straight forward and offered a personal look at the series from the view of Henry. Up next is a featurette called "The Secret History of Get Smart". A multitude of people involved with the show and even some who were just impressed by it come out of the woodwork to talk about how the series came to be. Some of the finer details of the show are hit upon and I found this feature to be very interesting. The next feature is a collection of six television appearances. The most interesting to me was the NBC Fall Season Preview from 1965 but others from an appearance on The Andy Williams show to the Get Smart Show Promos provided an interesting look back in time. One of the most amazing features here in my opinion is a two minute Blooper Reel. These goofs caught on film are virtually unheard of from the 1960's and as such this is supplemental material at its best. Rounding out the first season's bonus content is an interactive game involving the Chief's office and some of CONTROL's gadgets. This is just fluff compared to the weighty hour long Reunion Seminar feature from 2003 at the Museum of Television & Radio. It provides an interesting roundtable-like discussion and even includes Don Adams who is sadly no longer with us. 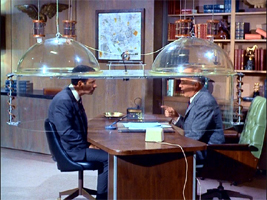 The second season of Get Smart offers up another pair of audio commentaries before you get to the final disc in the set. 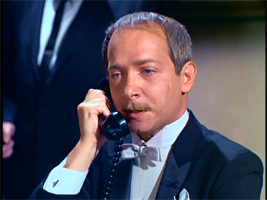 On the first disc is a commentary featuring Bernie Kopell (Siegfried) for his premier episode "A Spy for a Spy". 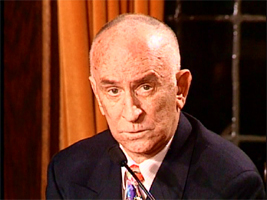 Leonard Stern also chimes in on the fourth disc for the episode "A Man Called Smart, Part 1". Both tracks are on par with the ones in the previous season and most likely could have benefited from multiple commentators. Still, hearing their opinions and memories regarding certain events was interesting. Moving on to the fifth disc the first feature is yet another interview. This time around it's with Leonard Stern and starts off with him talking about what his role was and how the show got started. It was kind of redundant after Henry's interview and the "Secret History" feature but Stern does talk about some things from his own perspective which adds something else to the show's history. 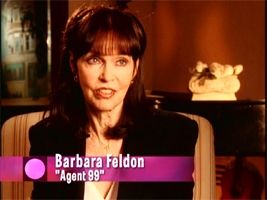 The next feature is all about Barbara Feldon and how she became involved on the show. It's kind of funny to think that Buck Henry saw a commercial of her with a tiger rug and felt that she would have been great in the show. There's a lot of discussion about the character of Agent 99 and how she became a positive role model for women at the time. After that feature there is a pair of clips from the 1967 Emmy broadcast where Get Smart won awards for Outstanding Continued Performance by an Actor in a Comedy Series and Outstanding Writing Achievement in Comedy. Another string of bloopers are presented on this disc and clock in at over two minutes of content. Some more bits from the 2003 Reunion Seminar are included as well though this time around the feature is less than five minutes long. 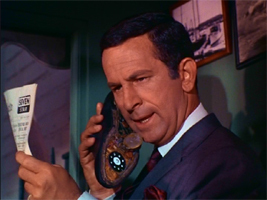 In this season one of the most impressive inclusions has to be Don Adams' 75th Birthday Celebration. This 53 minute feature was a cross between a roast and an awards ceremony thanks to the stars that appeared. The man of the hour gets up and delivers a deeply personal and charming monologue as he thanks his friends and family members for the time they have given him. This felt like a gem from someone's private collection and really gave this release a personal edge. Finishing off the second season's bonus content is the interesting showing of some of NBC's Standards letters. These were given back to the producers and writers as a way of ensuring that their program upheld the standards of NBC. Particular scenes were forced into being handled certain ways and lines were encouraged to be delivered in a non-sexual or morbid manner most of the time. I found this kind of cool because as the public we never get to see these in-house memos. Lastly there is another interactive feature but instead of Chief's office we're scouring through the contents of 99's purse. Just like the prior two seasons two more Audio Commentaries show up in the third. For the episode "Little Black Book, Part II" Don Rickles sits through most of the episode and talks about his experience guest starring on the show. He reminisces about moments with Don Adams and some of his adlibbing but after 16 minutes he kind of just leaves; saying that he doesn't really need to sit through the episode. Accompanying this commentary is a hilarious pair of bloopers with Rickles and Adams. The other commentary for "99 Loses Control" features Feldon and Henry, which offered a nice change of pace because there was more than just one voice. Director Bruce Bilson is the next crew member that gets interviewed. He begins by talking about how he got involved with the show and a little bit about his directing style. He also talked at length about working with Don Adams and some of the other actors on the show. The Featurette this time around is all about the gizmos and gadgets that CONTROL and KAOS used in the series. We see them all throughout the 138 episodes but hearing more about their origins and various other uses was great. Another batch of TV appearances and spots appear in the third season as well. Three more Emmy Award broadcasts are included for Outstanding Comedy Series, Outstanding Continued Performance by an Actor in a Comedy Series, and Outstanding Directorial Achievement in Comedy. There is also another Get Smart promo and appearances on the Andy Williams Show and Milton Berle's Mad, Mad World of Comedy. Another great blooper real is included on the fifth disc as well as the Don Rickle bloopers again. A few more minutes of the Reunion Seminar from 2003 are also featured in the third season and more of the NBC Standards Memos. The interactive feature this time around involves Smart's Sunbeam Tiger. In the fourth season the only audio commentary available is by James Caan who talks about "To Sire, With Love, Part II". Once again this track is on par with previous single commentator tracks for the show with a fair amount of insight into his experience working with Don Adams and appearing on the show. For the interviews available in this season Bernie Kopell and Barbara Feldon give up some more of their time to discuss several topics and answer questions. Both of them give very personal accounts of their time with the show and a glimpse into their private lives. One of the better Featurettes from this collection was "Code Words and Catch Phrases". Anybody that has ever watched Get Smart knows all about the zany code words that CONTROL used and even more of Smart's choice phrases. Once again there are more TV appearances in this season. Another pair of Emmy Awards Broadcasts, promo videos, and a clip from the Rose Parade with Adams and Feldon are all here. Three commercials even make the grade for Pepsodent, White Castle, and Chief Auto Parts. And of course we have more classic bloopers and an interactive feature for Max's Apartment. The last audio commentary available in the Get Smart Collection is for the episode "Ice Station Siegfried" and features Bill Dana (Agent Quigley) doing the talking. This commentary was again similar to the prior ones but still provided enough interesting tidbits to be worth watching. As is the case with any popular show there are fans who take their love to the next level. Maybe it's a website or possibly a prized collection of memorabilia but these cult followers of a series are almost always out there. Occasionally a series will recognize the fandom that helped maintain its popularity throughout the years. That's what the featurette in the final season is all about; the fans. Clocking in at over an hour and twenty minutes is video from Don Adams' memorial service. Friends and family members stand at the podium and recite memories of Don and talk about the man they all loved. It was heart wrenching at times and downright funny at others. You can have nothing but warm thoughts about a brilliant and funny man who captivated the world time and time again. Don is surely missed and I was very pleased to see this service included for us to see. After the memorial service there are some more TV appearances including more commercials and visits to other shows. Bloopers are here again as well with some new material but a couple of repeats. Another interactive feature is available on the fifth disc along with a clip reel of some of Smart's best moments over the course of the show. Having Get Smart on DVD is a dream come true. This was a show that was inspired from the very beginning. 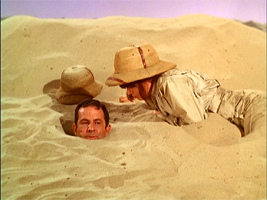 Throughout television history few shows have achieved as much as Get Smart did. In so many ways it was one of the best series to come out of the 60's and it's a testament to that quality that we can still watch it forty years later and laugh so hard it hurts. Yes the fifth season featured the weaker moments from the show but weak by Get Smart standards is still better than half of the shows on TV today. Time Life truly went all out when putting together this DVD set. The video and audio has been cleaned up to an impressive degree. It may not have the HD transfer and 5.1 surround sound that we have all come to expect but the fact that it was restored to the level of quality that it was is a feat. The bonus features absolutely blew me away with a total of nine audio commentaries, five interviews, six blooper reels, five featurettes, a fine collection of TV appearances, and some very personal moments with the cast. I personally loved the fact that Adams' 75th birthday celebration and memorial service were included. Taking everything into considering I am going to do something that I have not done before. I have written over 300 reviews for DVD Talk and Time Life's Get Smart is the only that that I feel has deserved the prestigious DVD Talk Collector's Series rating. This show is a classic in every sense of the word and this collection is so complete that not recognizing its quality would be a crime. This is a set that deserves a spot on your DVD shelf whether you buy it now through Time Life or wait for it to hit store shelves later this year.